The United States began its quest to put man in space after the Soviet Union put the first man-made object - Sputnik - into earth orbit. Project Mercury was the first phase of that effort with the first two flights using the available Redstone stack which could only achieve suborbital flight. The third and subsequent flights used the Atlas stack which had the power to push the Mercury spacecraft into orbit, but had a less than stellar reliability record. Horizon Models is a new kit company from down under (Australia) who has become the first company to produce the Mercury Spacecraft in 1/72 scale in decades (the venerable Revell kit remained the only option in this scale with the only other options being the Revell 1/48 Mercury/Gemini kit also from the 1960s, and the stunning but huge 1/12 Mercury from Atomic City). 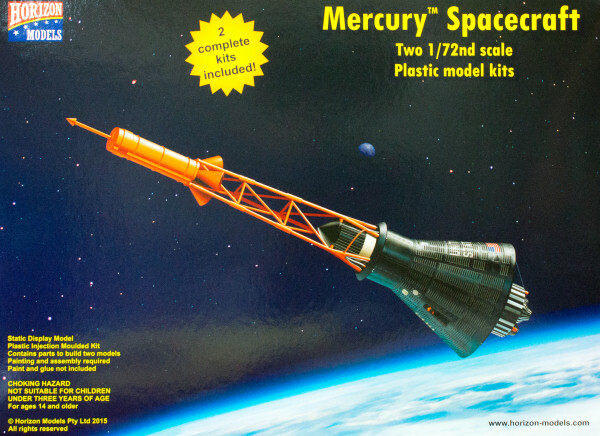 Several years ago, DML did produce a 1/72 kit of the Mercury and Redstone stack in the configuration and markings of Alan Shephard's flight. 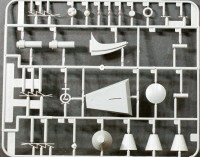 The kit is simple enough that the instructions are printed on the back of the box, yet they are thorough enough to cover the parts and markings needed for the Big Joe, MR-BD, MR-1 to MR-3, MA-1 to MA-4, and MA-5 to MA-9 configurations including marking differences unique to each mission. The decals are printed by Microscale. The good news is that there are two complete kits in this box so you can pick your two favorite missions and accurately replicate the spacecraft details accordingly. The bad news is that you'll want to replicate all seven manned flights and even a chimp or test article, so you might want to get at least four of these kits to render these configurations. That would look awesome to have at least seven of these on a nice display stand to honor the Mercury Seven and the United States' entry into manned spaceflight (after the Russians). I hope Horizon does the same work with the Gemini and Apollo spacecraft! For a look at the Mercury/Atlas built-up, look here.